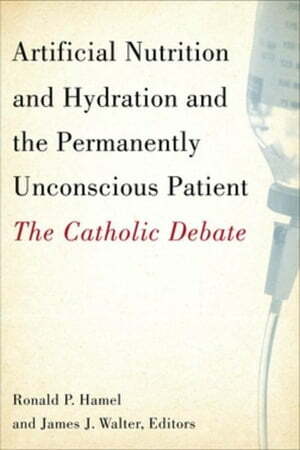 Collins Booksellers - Artificial Nutrition and Hydration and the Permanently Unconscious Patient: The Catholic Debate by Hamel, Ronald P., 9781589012424. Buy this book online. During the past few decades, high-profile cases like that of Terry Schiavo have fueled the public debate over forgoing or withdrawing artificial nutrition and hydration from patients in a persistent vegetative state (PVS). These cases, whether involving adults or young children, have forced many to begin thinking in a measured and careful way about the moral legitimacy of allowing patients to die. Can families forgo or withdraw artificial hydration and nutrition from their loved ones when no hope of recovery seems possible? Many Catholics know that Catholic moral theology has formulated a well-developed and well-reasoned position on this and other end-of-life issues, one that distinguishes between "ordinary" and "extraordinary" treatment. But recent events have caused uncertainty and confusion and even acrimony among the faithful. In his 2004 allocution, Pope John Paul II proposed that artificial nutrition and hydration is a form of basic care, thus suggesting that the provision of such care to patients neurologically incapable of feeding themselves should be considered a moral obligation. The pope's address, which seemed to have offered a new development to decades of Catholic health care ethics, sparked a contentious debate among the faithful over how best to treat permanently unconscious patients within the tenets of Catholic morality.